I don’t like the salt, the sand, the heat... I do go to the beach, though – Joao loves it. And people do the craziest things for love, don’t they? Bill Granger reminds me of the beach – it seems that everything he makes has a tropical, fresh feel. Not to mention that gorgeous house by the ocean we see on the show (Joao would love to have one like that). This is one of his recipes and I liked the result very much. Preheat oven to 180ºC/350ºF; grease and flour a 21x10cm (8 ½x4in)* loaf pan. Lightly whisk eggs, milk and vanilla together. Sift flour, baking powder and cinnamon into a bowl, add sugar and coconut, and stir to combine. Make a well in the centre and gradually stir in the egg mixture until just combined. Add melted butter and stir until the mixture is just smooth, being careful not to over-mix. Pour into prepared pan and bake in the preheated oven for 1 hour, or until bread is cooked when tested with a skewer. Leave in the pan to cool for 5 minutes, and remove to cool further on a wire rack. Serve in thick slices, toasted, buttered and dusted with icing sugar. * I used a 26x10.5cm loaf pan and it was pretty full. The batter did not overflow, though. You're killing me... :p I'm already on craving overload, and this is one to add to my list. I love coconut and that bread is right on calling to my taste buds. That bread looks great. I also like the corn ice cream idea. What would that ice cream be good with? You're not alone. I also hate the beach during summer. But I love it during autumn (when it is not too cold). Now I live 500km away from the coast- I do miss it sometimes. Man, does this bread look good. So good that I'm considering leaving my computer right this second to go make a batch! 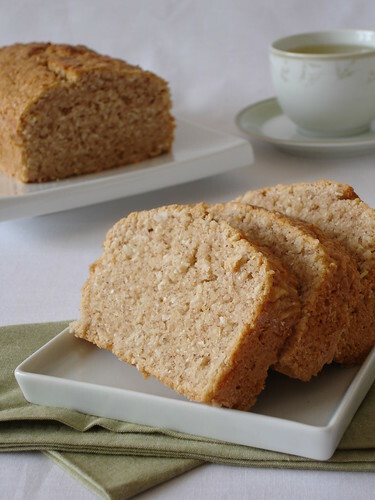 I am so in a coconut mood right now... this bread would hit the spot! I have a love hate relationship with the beach, I love swimming and how my feet feel so soft after walking in the sand, but I hate the seaweed and stingy things in the water, and I hate how sand gets into everything! This coconut bread looks delicious, I would like to make it, and ad some of the fresh limes I just bought to it...mmm summery bread. I've had my eye on this recipe for so long, yours looks terrific! Wonderful food styling Patricia. I've known you for a while now, so I'll be blunt: that beach-hating thing is a little odd. :) Each to his own, right? Like my husband, who hates coconut. I would have to eat all this bread myself, but I don't think that would be a problem. Can I join your clique of freaks? ;-) Coming from sunny South Africa I've always been as pale as a ghost since I don't like sitting in the sun and steadily turning into a raisin. Yum this looks really good. I think its time for dinner because I think I could eat that whole loaf in one sitting! Patricia - I thought I was the only one who didn't like the beach. I go if I have to, but it's definitely not my choice. Don't worry I'm one of them too who hate the beach. Think its a waste of time lying on the sand for hours just to turn myself into a lobster! Don't mind going for walks on the beach when the weather turns cold though. For my little child's sake, I do try to make the effort at least once during summer to give him the taste of the sand and the sea. I live in Australia and I love Bill Granger and own all his books. This bread is a winner ! Hello! I only found your blog just yesterday and am now about to try this recipe out! I love coconut and this looks like it's really easy to make. I love the beach, but will forgive you! This coconut bread sounds delicious! How amazing does this look! I love coconut and I think I could probably eat lots of this. It looks gorgeous, so moist! I love Bill's stuff! And I love coconut! This looks great! Well ... I LOVE the beach. Our family has a house at the coast and we spend a LOT of time there! Can't wait for it to warm up here. It's brrrrr cold outside today! 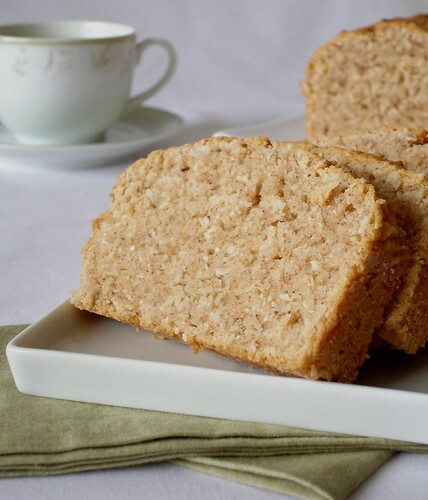 I love the idea of coconut bread. I'm sure the flavor is fantastic! I'm not a big fan of the beach either. :) I do like this coconut bread though. Unbelievable, this coconut bread sound divine. Your bread looks delicious! I tried this recipe awhile ago expecting to love it because it's coconut but I was kind of disappointed with it. I love the beach but I wouldn't dream of throwing rotten tomatoes at you or anyone else holding a loaf of that delicious sounding bread! Eric, thank you for visiting! That ice cream is really good on its own, but some caramel icing would be fantastic. May, I like the idea of walking on the beach on cooler days. Chris, that sounds amazing! I love citrus and I think it goes wonderfully with coconut. Elyse, I hope you try it! Finsmon, I love coconut, too! The idea of using limes here is fabulous! Aimée, you made me laugh! You can be blunt, darling, because I know you mean well. Katie, I know you must have cooked something amazing for dinner. Dorie, I'm glad you stopped by, tks! I adore so many foodies from Australia, it's great to know you are reading me. Lisa, tks for visiting! Hope you like it! MonkAre, thank you for stopping by. Ash, I love Bill's recipes, too! Cooking Ninja, the cinnamon adds such a nice touch here! Ashley, really? I remember seeing it on your blog and it looked marvelous. Too bad my Bill hates coconut..more for me!! I love this bread! Can't believe it's been almost a year since I last made it!! P.S: I think it could be a madeleine...hint...hint! You don't like the beach!?! :-O That's ok, I still like you--especially because you make yummy food like this! i made that bread a few years ago and it was a big hit. time to revisit this again! I just made a pumpkin & coconut bread as I was severely craving toasted coconut...wonder how many people crave that? one slight error in the ingredient list. it should be 1 1/4 cup milk. Eri, thank you for letting me know, I've corrected it already. Wonderful bread has turned out today at me! It is fresh, soft, fragrant! Thank you! Niksya, that is wonderful news - thank you for letting me know!